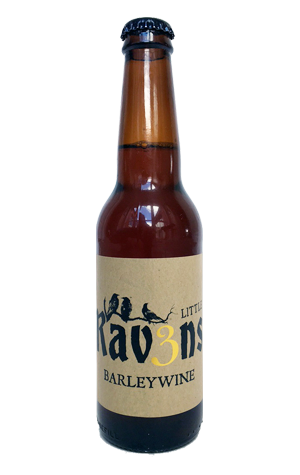 As part of their recent brewery bar first birthday celebrations, 3 Ravens brewed a barley wine. It will become an annual thing, with a portion of each year's brew being added to the subsequent year's vintage, inspired by the Solera method of fractional blending traditionally found in other industries. To kickstart the lineage, into this first batch was poured the last few litres of a five-year-old stock ale that was originally part of the brewery's Bitter Sweet End. It was joined in the mix by some in-house malted and toasted barley and aromatic Aussie hops Galaxy, Vic Secret and Enigma then fermented with our London ESB yeast. Half has been bottled for release now with the rest going into freshly emptied shiraz barrels from Balgownie Estate. It's a combination that makes for a peculiar beast at this young age: there's a cocktail like intense orange citrus and maraschino cherry character throughout what's a relatively viscous, copper coloured drop. Malt and alcohol sweetness combine with bready flavours and some boozy warmth, with the former likely to broaden and become more fortified over time as the latter – not to mention its sneaky bitterness – mellow. One to put away for a while, perhaps to sample alongside the barrel-aged version when that appears.